The 250 is ok. The extra bit is along the coastline between Geelong and Queenscliff and a bit more interesting, it is very flat as is pretty much the whole route. Also it’s not really 250, more like 240km. I guess it comes down to whether you want to ride those 30 extra km. Guess who’s in da house?? Been a while, all that new forum password hoopla at start of year didn’t agree with my digestion. Anyhoo. Been a bit going on in my cycle life, started racing about 6 months ago. Local Crits and Road/Kermesse situations. Started easy in D grade, won that series, and money!, now managing to mix it with C grade and having an absolute ball. Racing has totally changed my outlook on riding, as well as fitness levels, which have gone up by at least 150%. It’s amazing what you learn about yourself when you’re averaging 193bpm heartrate for 45mins solid. Still on my Scott Addict, and paired with a pair of Zipp 404s, a very handy and lightweight Crit weapon. Girlfriend and I have a cycle tour of Japan lined up for October, which is going to be totes rad. The guy that runs Ride Japan Tours is a local Cairns boy now based over there. Looking at a 5 day tour, about 650km and over 7,000m climbing. Suffice to say, hills training has stepped up somewhat. Anyway, good to be back. Welcome back … was wondering what happened to you. I have not ridden the Amy, but have ridden much of the course. The climbs are solid, but nothing special. I don’t know where you ride normally, but if you make sure you’ve been training, climbing similar sorts of inclines, you’ll be ok. But I would not attempt if you’re not comfortable riding 120km and say 2000m climbing. The course this year is anticlockwise - which means the hardest climb is up first and you come down Skene’s creek rather than ride up it (much harder climb). I had been pondering the joy of not having gone thru a season of “How great are we this year/how shizen are we this year? ?” nonsense. Coming in at this time of year is actually a real breath of fresh air!! What’s everyone’s take on compression tights under bike bibs? Thinking I might get a bit cool in the maountains in Japan, so tossing up a pair of 2XU tights, or just long leg bibs. I’m a bit keen on the 2XUs since I can wear them at footy training year round, while long leg bibs have no place in FNQ, even in the dead of winter. Suggest leg warmers are a better option. They have to be a bit tight to stay up, so you get some compression effect. Only go up to top of thigh, so no effect on chafing or seat comfort. Plus you can put them on or take them off without removing your shoes or bibs/nix. Plus for long rides you don’t have to worry about putting UV protection on legs. If you want to use tights, wear them over your bibs, not under. I have a pair of “overs” that I use on commutes where I have cold mornings, but warmer afternoons. Or I expect it to be wet on the return journey. 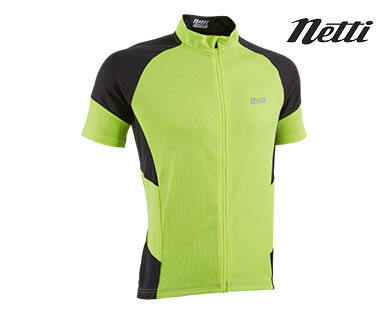 I didn’t need any more cycling tops, but hard to go passed this $20 hi-vis yellow number by Netti via ALDI specials today. Yeh I saw those, wife would freak if I got yet another jersey! I did buy the degreaser and the netti gloves though! I won a pair of 2xu tights from running heroes. They are very good, sometime i just wear them on the bike (no bibs) but i dont go far. I probably would wear them under the bibs. Not quite two years either. A bit disappointed, only 28,000km on these. Bummer. Yes, would expect better. How long is the crack? Couldn’t figure while the wheel wouldn’t hold true. Took the tyre off and it sprang open! Have ordered some Pacenti Forza rims to rebuild the wheels. Bottom brackets are funny things. Mate has a brand new Domane and his BB went after 4K. Mine has 56,000km on it and still going strong! They do say if you ride your bike frequently, the bearings last much longer. “Weekend” bikes tend to go through BB and wheel bearings much more frequently. There’s every chance that’s the problem. I’ve left my bike unattended for long periods at a time and then smashed it senseless after.